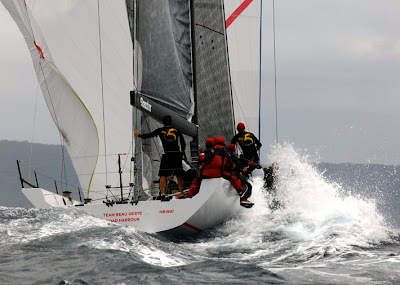 Team Beau Geste from Hong Kong, skippered by Karl Kwok and helmed by Gavin Brady, is striving for a series whitewash in Australia’s inaugural TP52 Southern Cross Cup. But the pesky new kid in town is causing ripples for the international visitors. Two more bullets offshore today, Saturday 14 December, and Team Beau Geste is leading the way in the Premier Composite Technologies TP52 Southern Cross Cup regatta, the closing round of the four-part series. 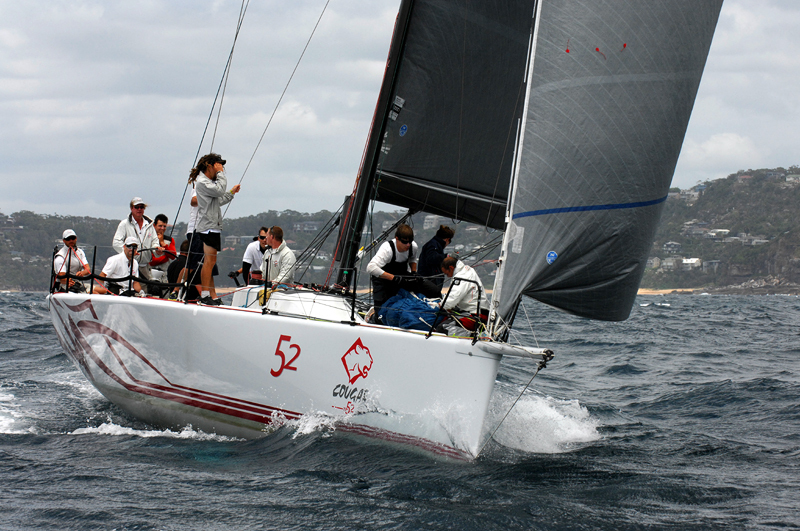 Bob Steel’s Sydney based Quest is shadowing TBG, only two points adrift. “Quest is on a roll, they are the new kid in town,” acknowledged Brady this afternoon. 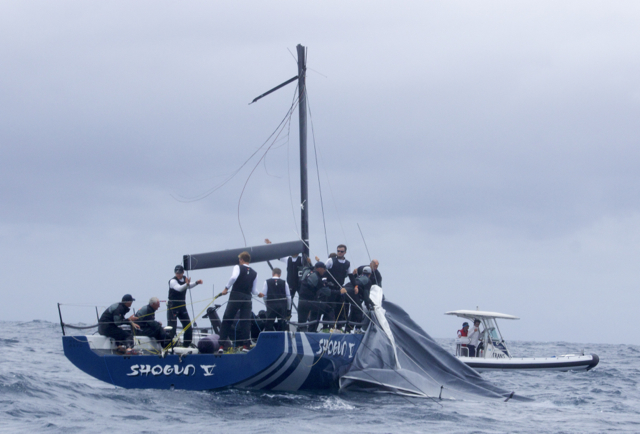 Rob Hanna’s Shogun V was his main adversary until the TP52 from Geelong in Victoria snapped her mast in today’s opening race on Palm Beach circle course, sadly ruling them out of contention. Kwok’s boat preparation is meticulous and Team Beau Geste, the last boat standing of the newer generation TP52s that began the series back in February, has suffered the least amount of breakages. “These boats are pushed to the edge and where we are is a tribute to Karl’s preparation,” praised the owner’s long-term driver. Quest missed the first two rounds of the Southern Cross Cup on Port Phillip Bay back in February and April, and exited round three early with damage, making them ineligible for the overall Cup win. Bu their impact on the scoreboard in round four is still worrying Team Beau Geste. Northern Beaches local, Jamie MacPhail, Quest helmsman for owner Bob Steel. He says the capable crew of Sam Newton, Seve Jarvin, Troy Tindill, Andrew Pearson among others are still figuring out how to sail fast with a new rig and fat head mainsail. He warned there is plenty more in the tank for the offshore racer now configured for regattas. Not so lucky was the Tasmanian TP52 Cougar II, skippered by Anthony Lyall. By the end of race four they had blown out three spinnakers and one headsail and were shouting for the spare chute. Coming into the Royal Prince Alfred Yacht Club, Cougar’s engine cut out and the boat needed to be stopped before it crashed into the marina. Crewman John ‘Spud’ Drummond lassoed a cleat and saved Quest from certain damage, named by the thankful crew as hero of the day, relayed tactician David Chapman. On the cost of repairing or replacing all the torn sails, Lyall, a doctor at Beaconsfield in northern Tasmania said, “It’s the only reason I work.” Cougar II is third on the leaderboard after five races. Rob Hanna’s Shogun V dismasted mid-tack on the upwind leg of the day's first race. In a rolling ocean the crew worked furiously with hacksaws to free the rig, with both mainsail and headsail still attached, from the windward side of the boat before it potentially swung in and pierced the hull. Fellow TP52 owners empathised with Rob Hanna’s misadventure. “I really feel for the Shogun guys,” said Vamos skipper Connel McLaren. Brady added, “It was incredibly unlucky for Rob, this was his day”. Vamos (NZL) finished cleanly in fourth place overall, McLaren ruing the fact Quest has trumped them in every race, “Tomorrow will have to be our day,” he cautioned. The RPAYC race committee, led by PRO Stephen Merrington, was hoping to hold three races but after taking into consideration the conditions, a nasty 1.5 metre swell and 15-22 knot southerly, and the dismasting of Shogun and recurring sail damage on board Cougar II, crews packed up after two races. 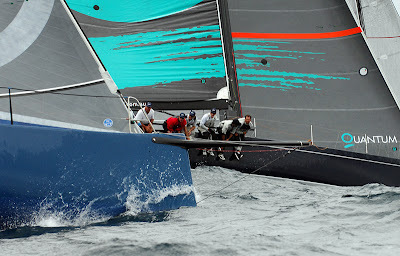 The remaining five TP52s will race inshore tomorrow, Sunday 15 December. 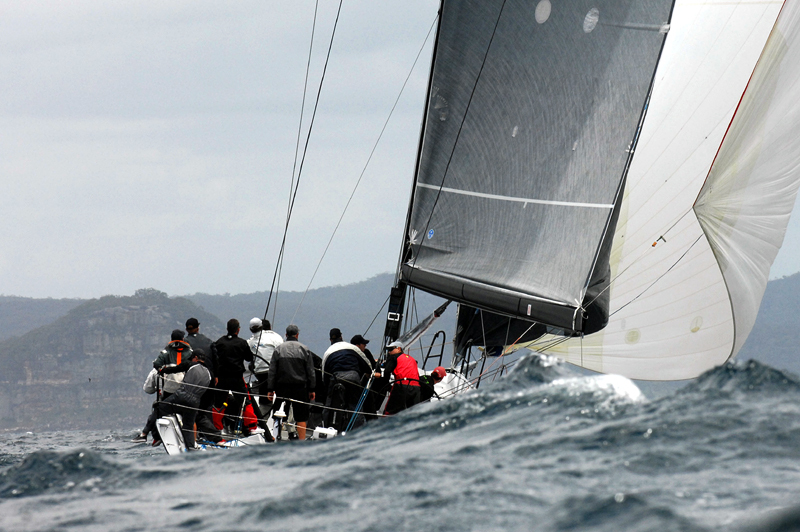 At the 0955hrs warning signal the fleet will be in sequence for the first of two races that will be held to the north of Scotland Island in Pittwater. The forecast is for southerly winds 10-15 knots turning south-easterly late morning.